If there is one showhouse I wish I could have toured, it would be Elle Decor’s. 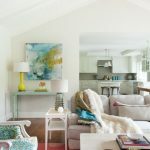 As you already know, I was head over heels for the guestroom in the home, but the kitchen and sunny breakfast nook designed by Palmer Weiss are incredibly breathtaking as well. 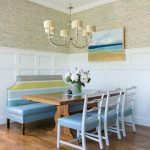 The curtain fabric (Quadrille Palampore Stripe in Multi Blues on Cream) is just so so pretty, and looks amazing with those yellow chairs. The Ann Sacks backsplash is downright droolworthy too! 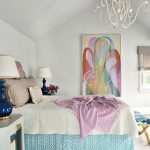 Read more about the showhouse here, and for more delicious designs by Palmer Weiss, check out her website! That kitchen is so inspiring. It's beautiful and elegant at the same time. Thank you so much for stopping by yesterday. It's always a great surprise reading your comments!! Im loving it!! That kitchen is just amazing. So you'll have to stop by and read my post- I totally thought of you when I was putting it together! That dining area is eye catching. What bright, shiny chairs. So unusual. Erin that breakfast room is stunning, the light, the fabrics! Palmer's work is incredible! She's obsessed with the details. She bought a pair of lamps from us for a project in San Francisco and flew to Austin to make sure the color was just right. Of course Austin is not a bad place to visit. This a wow shot with those yellow chairs. It put a smile on my face. I like this whole kitchen dining area very much. Erin…all I can say is that I just discovered your blog and LOVE it!! I LOVE turquoise- my favorite colour and this is amazing!!! Im currently redorating our master bedroom and the inspiration is 2 chairs that are seaform green and white. Thank you so much for inspiring me even more!! Amazing!! So much fun to see a whimsical garden chair in the mix! The unexpected in the room. 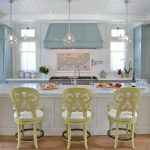 The island in the kitchen is beautiful! I love the mix of drapes with the yellow chairs. I loved this room! The drapes are gorgeous. Gorgeous! I too, love those curtains! Don't you just love those retro chairs? And what a great color! I don't know what it is that I love soooo much about the little kitchen area- but I just love it! I might copy it for me. haha I love it. Well the post is superb. All designs are beautiful. I am impressed with all these designs. Thanks for a great sharing.